The one week was too long to wait for episode 7. The time wasn't easy to spend, it made us die out of curiosity. Will Eul able to bring back Joon Young and reconcile the things happen at the beach. Joon Young avoid Eul make a surprise how on earth he could do this, what with his behaviour and what is he up to ? It never easy to judge the climax in korean dramas and not every story is easy for the love birds to have a smooth relationship without pains and hurdles. We feel sorry for Eul as for as Joon Young. He was suffering from pain but couldn't show to any one. Eul tried all her best to conience Joon to come back. The thing we were irritated was Joon's act of counting , one , two , nine and a quarter etc. 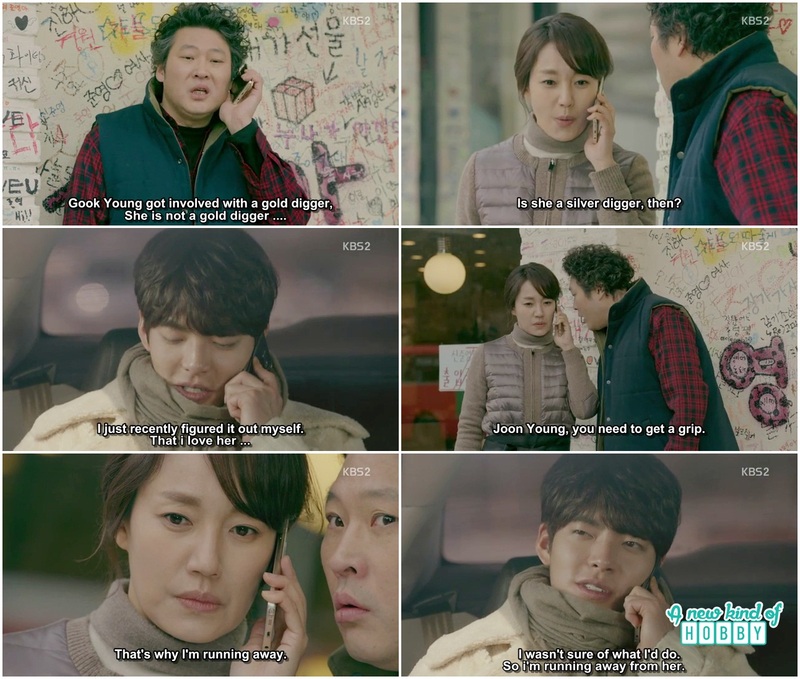 Eul was like a puppy who is after Joon Young to make her normal as he was always. But Joon Young wanted to avoid her and the reason we didn;t understand, but it was for sure he want to spend time alone. 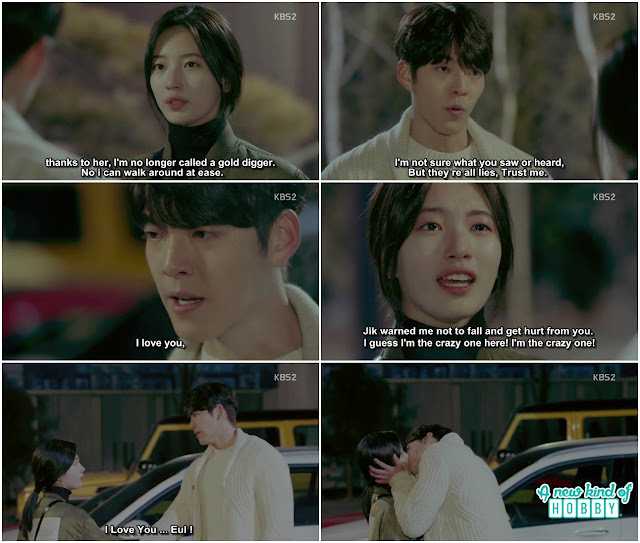 He get out of the car and the next moment Eul confess she remember what happened that night. How she get drunk and threw a fit, also throw upon Joon Young back .. she was thank you Joon help her change the clothes and wash them out. But she and us both were surprised by Joon's act for leaving her behind and took a cab. Men he is too crazy to get out of Eul sight. 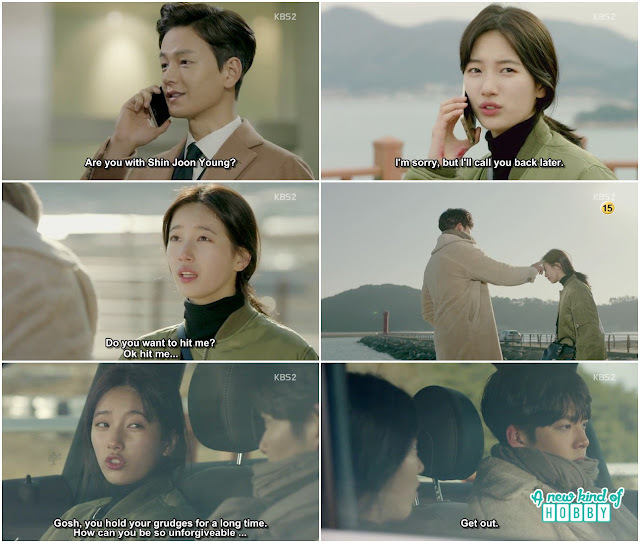 Then Eul wake up the manager who was sleeping in the back seat of the car and told about Joon Young. He was also surprise to hear the situation saying, saying what did you do wrong to him, that he is this mad?. She hit her head i can't remember anything but it made me feel that i did something wrong to him. The manager hit her head do you remember anything and he Shouted "EEEEhhh". It was a very confusing situation for us we didn't understand on which turn the story would going to up? Joon Young borrow the can driver's phone and called her mother. He knew she was too worried, in fact the mother was worried where on earth Joon Young is. He confess that he is in love with a girl and wanted to run away from her. Saying "I am not sure what might do, so i am trying all my best to run away and avoid her". It was a surprising confession, it was her mother's first time showing interest in Joon Young and his situation. We were glad that now there relation ship will become smooth and normal. The manager told Eul that Joon Young might be fall in love with her. 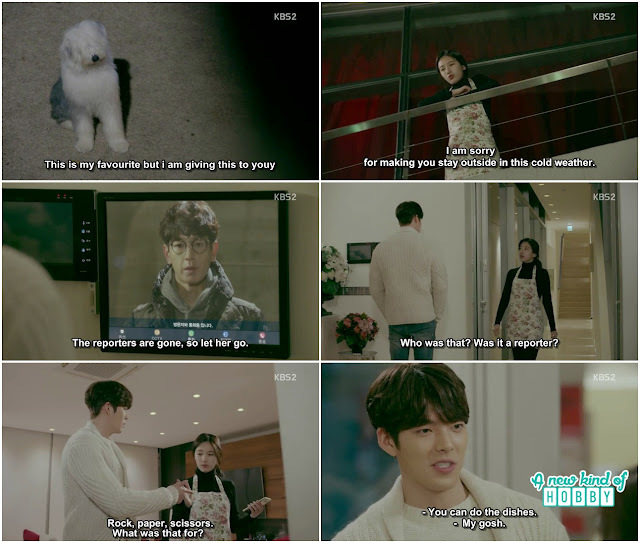 He become starnge for some times right after Eul faint at his house, "He even kicked prororo out .. when find out you have allergic to dogs". Eul was shocked to hear and dint accept why would he fall for her. The manager explain "you are a wise women and acknowledge the truth, that's why i like you". He is acting all weird after his last drama shoot where he hit by te wood on his head, may be the brain got swelled. Eul thinking what " if he really likes me"? The manager replied "then i will take you to the doctor along with Joon Youn" and we laughed. Every time Eul with the manager they argue and fight over Joon Young. Eul proves to be a bad cook and hurt her fingers, Joon Young then gives the first aid by putting her hand in water. 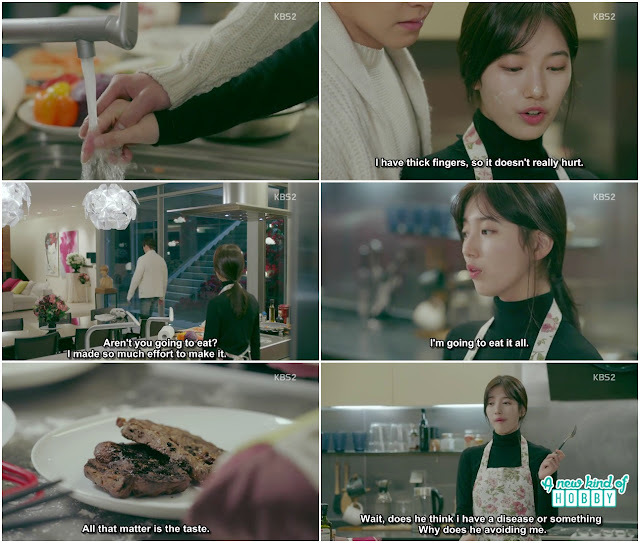 We thought he would going to do something else to surprise Eul but he simply walked out of the kitchen. He ask Joon Young come and have dinner but he didn't reply, she taste what she made saying the shape doesn't matter all that matter is the taste after she said "It too salty". 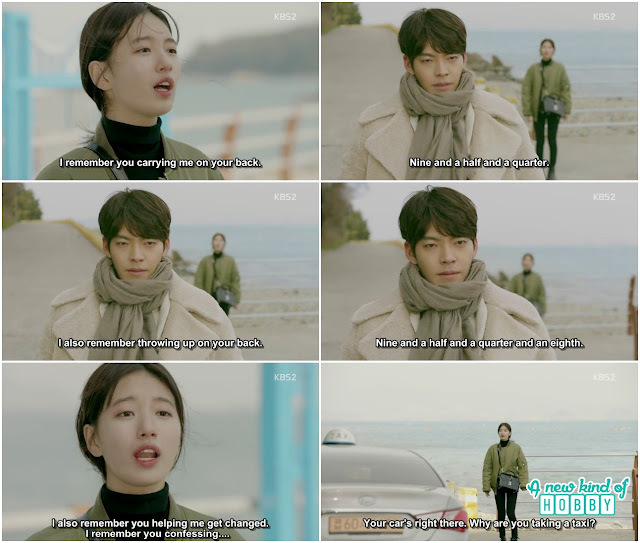 She then realized Joon Young is avoiding her but why "Wait, does he think i have a disease or something, Why does he is avoiding me". Seriously she was unaware that its not her suffering but in fact Joon Young was all suffering by himself. We feel pity for Joon's situation and was praying a miracle should happen and his love life become smooth as other people. 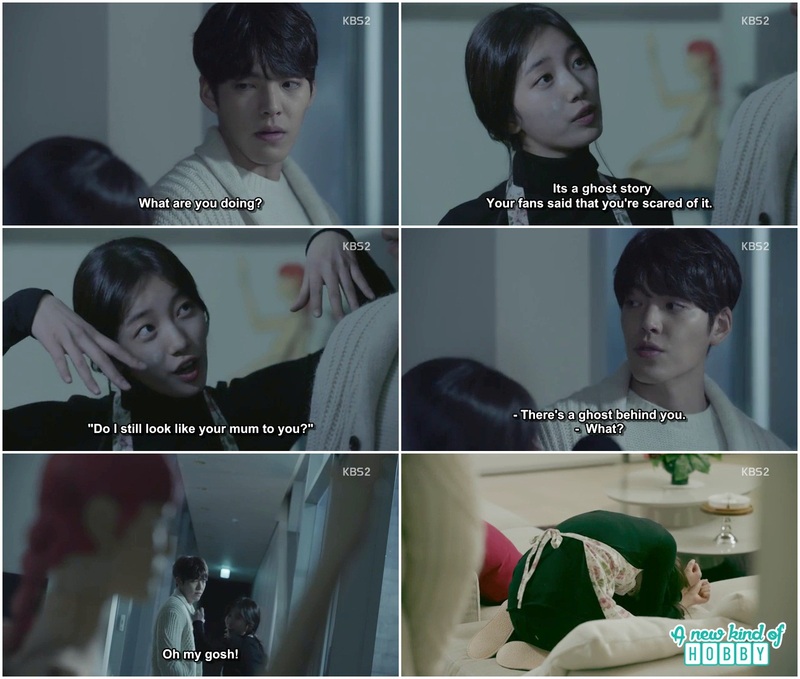 It was the hilarious scene i laughed and my sister also got scared along with Eul. It was when Eul trying to scare Joon Young saying i heard you are afraid of Ghosts and she acted like a Ghost but Joon Young said "there is a ghost behind you" , she turn around "Oh my Gosh" and scream jumping over the couch. Joon young made fun of her and i made fun of my sister saying why do you get scared ? She said you know its a korean drama and any time it become scary that made me scared. Joon young turn on the lights saying "I wanted to make fun of you", Eul jump over him saying do want to die, was that funny ? did you enjoy making fun of me? We laughed while Joon Young was serious, he replied "i tried my best to run away but you are the one who decided to stay". It was such a romantic dialogue till now we feel like falling for Joon Young. Another touchy scene we feel bad for pororo, Eul threw a sweet sausage to pororo saying she was sorry for what happened and she is doing her best to fix her allergic by using medicines. Ji Taek ajushi came all the way to Joon Young house for Yeol but Joon Young decided not to let her go, he avoided the video conversation and suddenly play rock, scissor , paper with Eul. We were curious what is he up to, it was bot to let Eul go with Ji Teak, he made her wash the dishes. While Eul was washing dishes at Joon Young house she receive Na ri's call and shocked to hear Joon young put an act with her to save Kim Yoo Na. This news is all over internet and tv channels that Joon Young used Eul to avoid his and Yoo Na's scandal. This turning point made us crazy as well as Eul become angry. She came out and fought with Joon Young. No we feel sorry for Joon Young why he has to suffer like this, he denied everything saying don't listen to other, they are all lies. But Eul insisted that Jik warned her not to fall for you, i ll going to hurt my self and Joon Young confessed "I Love You ... Eul". It was too sudden for Eul to hear this out she turned and wanted to run away but Joon Young grab her and kissed her. He don't want to loose her again. It was their first kiss in nine years relation. 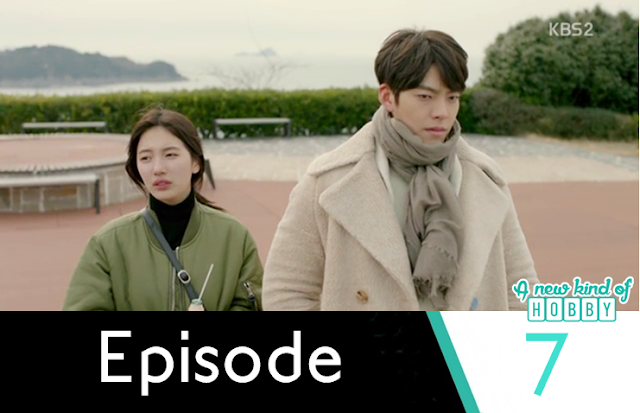 The episode ends leaving th curosity what will Eul's reaction in episode 8. Will she going to hit Joon Young, shout and scream or just walk away leaving him alone in despise. This ia ll for now stay tuned for episode 8 review.